And in that bright transcendent morning, the once unthinkable was, suddenly and inevitably, done. Who could resist the embracing magic of that moment? Years from now the magic will survive or not—and that judgment will rest largely on questions of war and poverty. Martin Luther King Jr’s conscious and courageous connection of racial justice to economic justice and peace is a legacy to embrace in “the fierce urgency of now.” Will this moment be ruined in the furnaces of war, or can we hammer swords into plowshares and become a nation among nations? Can we learn to really live by the principle that anyone’s suffering diminishes us all? The president’s speech looked in both directions: a return to past glory, a new awakening of peace and justice. A page is turned, and it’s now up to us write the next chapter. There is nothing to condemn about Ayers’ leadership over the past 20 years. The project in question was the Chicago Annenberg Challenge, a pairing of nonprofit organizations and schools funded by the late publishing magnate and mainstream Chicago foundations. Ayers had been one of the authors of Chicago’s proposal to get a slice of Annenberg’s $500 million multi-city school reform grant, and Obama was the project’s first board chairman. When the appointed hour arrived for release of the documents, reporters, camera operators and bloggers descended on the hapless university library staff to pore over hundreds of files of grant proposals, meeting minutes and reports — a “media frenzy,” the Tribune called it. 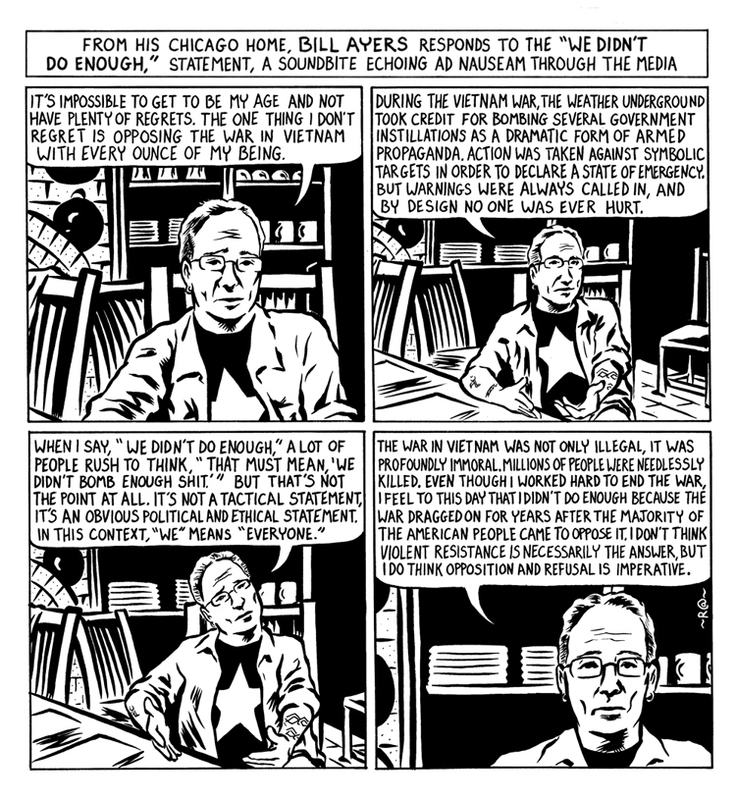 In other words, Obama does, indeed, know Bill Ayers as more than just a guy from the neighborhood. So do a host of civic leaders in Chicago. For example, the Chicago Annenberg Challenge board included Susan Crown of the General Dynamics Corp. family; Patricia Graham, former dean of the Harvard Graduate School of Education, and Arnold Weber, past president of Northwestern University and of the Civic Committee of the Commercial Club of Chicago. Indeed, just about everyone active in Chicago school reform in the early days saw Ayers as a colleague. No one ever accused them of being radical because of their association with Bill Ayers. Whatever one thinks of Ayers’ actions 40 years ago, there is nothing to condemn, and much to admire, about his leadership and commitment over the past 20 years in making schools better places to teach and learn. And there is nothing to condemn, and much to applaud, in Obama’s close association with those efforts. Some of the reporters assigned to dig into the Annenberg archives felt a little silly about it all, I’m told. Their editors should too. Linda Lenz is the founder and publisher of Catalyst Chicago, an education newsmagazine published by Community Renewal Society.